Children, here is a wonderful moral story from Hitopadesha Tales. This is a collection of short stories like the Panchatantra stories and Jataka Tales that have originated in the ancient times in India. Once upon a time, an old tiger was sitting on the bank of a pond posing like a sage with the holy 'darbha' (grass) in one of his paws. He had a gold bangle in the other paw. "Hey travelers!" shouted the tiger. "Come here and take this gold bangle. I'm an old tiger and will not at all harm you. I'm living a saintly life and this is of no use to me", the tiger was calling the travelers. Most of the passers by, did not listen to him and did not get trapped in the cheap tricks of the tiger. But one greedy traveler who heard the tiger's shouts, thought, "Ah! what a luck! But how can I trust this tiger which is a man-eater by nature?". "I have to take the risk for the gain", thought the traveler and shouted to the tiger, "Where is the bangle?". The tiger stretched his paws and showed the glittering gold bangle. The tiger found the gold bangle near the pool which might have been dropped by the passers by. 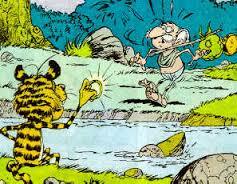 The poor traveler was very much tempted to get the gold bangle but he questioned the tiger, "how can I trust you? You are a fearful brutal animal. If I come near you, I will be eaten up by you". The tiger who was posing like a saint spoke politely, "I was a wicked and cruel tiger during my youth. I killed many people and cattle. For my cruel acts, I lost my dear wife and children. My relatives also left me. While I was living lonely and repenting for my past cruel acts, a great sage met me and told me to do charity. He told me to be generous and kind to others, so that I can lead a better life in my next birth. When I decided to give away whatever I have to the poor and needy, I found you who seem to be a poor Brahman. Now, I am old and don't have strength in my body. I don't have any ill-intentions of killing people. I am fully changed into a spiritual one. I meditate on the Lord and feed on grass and plants." "Look, I have no teeth and no nails in my paws. I can't even chew properly. Do you think I can harm you?" said the wicked tiger. "Don't doubt me, come, swim across the pond and take this gold bangle," the tiger spoke so nicely to the traveler that he completely believed the tiger and swam through the pond. The traveler got stuck in a marsh in the pond and could not swim. Seeing this, the tiger told him in sweet voice, "oh! don't worry. I'll come and help you." Slowly the wicked tiger went to the greedy traveler and lo!, he pounced on the traveler and dragged him on to the bank. By the time, the terrified traveler who was almost dead, thought, "Oh! god! how foolish I was! How could I believe a beast. I am losing my life because of my greed." While the poor traveler was thinking like this, the cruel tiger killed him and ate him up. The poor greedy traveler believed the words of the cruel tiger and lost his life. So, children, what did you learn from this wonderful story? What's the moral of the story? You can learn two things from the story. Do not listen to the sweetly spoken words of the wicked. Don't be greedy but be satisfied with whatever you have.